Rezoning to allow a 30-storey tower next to East Vancouver’s Joyce-Collingwood SkyTrain station is set to accelerate redevelopment in the area. The December rezoning of properties by Vancouver city council follows the city’s approval in June of a new precinct plan that hiked density guidelines for the neighbourhood, particularly for sites close to the SkyTrain station. Some residents are opposed to the looming densification while others accept that more density near transit hubs is desirable. Westbank Projects Corp. achieved council’s blessing to build a tower with up to 30 storeys at 5050 through 5080 Joyce Street, where single-storey and two-storey buildings now sit. The tower will have to meet a host of conditions before getting a development permit, but critics are concerned that the site is eligible for a floor-space ratio of 15.37 square feet of building area for every square foot of the lot, which is higher than anything else outside the downtown core. Saint Mary’s Parish is another landowner in the neighbourhood that is putting plans together to build a tower on its three-acre site about a block south of Westbank’s site. Money generated from developing the tower would help pay for a new elementary school, said Jack Ong, who is on the parish’s building committee. The parish’s site houses Saint Mary’s elementary school, the church, a playground, parking lots and the Columbus Tower seniors’ home. Couns. Geoff Meggs and George Affleck told Business in Vancouver that they saw much less opposition to density in the Joyce-Collingwood area than in the Grandview-Woodland neighbourhood, where council increased density for certain sites in August. That is why the vote passed unanimously, they said. They both also lauded council’s requirements that there be plenty of “family housing,” or larger suites, in Westbank’s tower. “We added requirements for a better pedestrian streetscape as part of the strategy and a daycare and all that stuff,” Affleck said. Some residents, however, view as inadequate the $4.72 million in CACs that Westbank has to pay to develop its tower. “[Councillors] say that CACs are great for communities because we can build community centres, move libraries and improve parks,” said Arielle Yip, a member of the Joyce Area Residents Association. She estimated that a new library would cost at least $10 million while a community centre would cost upwards of $15 million. Even if sufficient CAC funding were included in the area’s revitalization, many residents do not want new tall towers to be built because they are concerned about traffic congestion and construction noise, Yip said. The biggest concern, however, is that a slew of new towers will gentrify the area, push up rents and displace longtime residents and small-business owners – much like what is happening in Burnaby’s Metrotown neighbourhood. Ong said the plan being developed by Saint Mary’s Parish reflects those community concerns. “We want to be part of the solution by building 100% rental housing instead of more market condos,” he said. Real estate activity in Vancouver is spilling over into the commercial sector which saw sales activity jump 34 per cent in just one quarter. Real estate activity in Vancouver is spilling over into the commercial sector which saw sales activity jump 34 per cent in just one quarter, easily eclipsing the previous high, according to a new report. 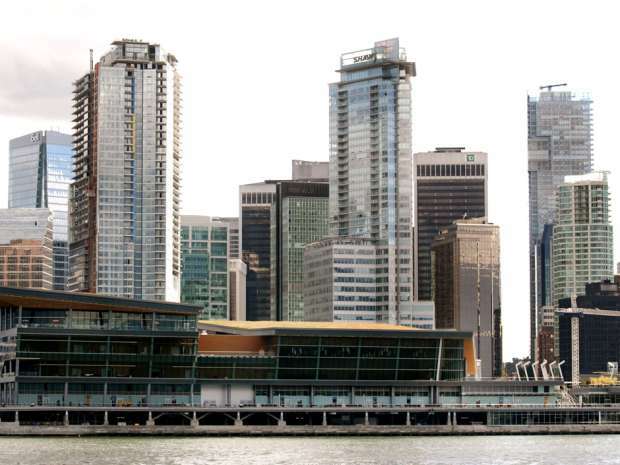 Commercial real estate service provider Altus Group said Wednesday that there were $3.75 billion in real estate transactions in the second quarter of 2016 — the sixth straight quarter of growth in British Columbia’s largest city. There were 875 transactions of more $1 million in the quarter. The number of deals in the quarter jumped from just 596 in the first quarter, a 44 per cent increase and the first time since Altus began recording data that deal levels were over 600 in a quarter. Just two years ago, the dollar volume of quarterly deals was hovering around $1 million. Office deals were up 110 per cent from the previous quarter and accounted for 11.4 per cent of all transactions in the second quarter. Retail deals jumped by 114 per cent from the previous quarter and accounted for 13.8 per cent of all transactions in the second quarter. Residential land acquisitions accounted for 37.3 per cent of all deals in the quarter and were up 36 per cent from the first quarter. Large deals are also taking place with 19 transactions for more than $25 million accounting for 28 per cent of all capital flow in the quarter. Greater Vancouver has had between 11 to 14 transactions worth more than $25 million since the third quarter of 2015. Mark Goodman, a principal at HQ Commercial, which sells apartment buildings in Vancouver, said sales have exploded in his sector with overseas money driving much of the investment activity. He calculates that over the first eight months of the year there were 145 apartment transactions, up 44 per cent from 2015. Dollar volume during the same period climbed 93 per cent to $1.3 billion. Apartments are impacted by a 15 per cent additional property transfer tax on foreign owners in the Metro Vancouver but Goodman said the buyers are local residents or permanent residents who are getting injections of capital from offshore. “Is that a foreign investor (who has to pay the tax)? I don’t know,” he said. CBRE Canada, a real estate service company, is expecting record investment from China in Vancouver in 2016 at all-time highs for prices. “Canadian real estate should be the beneficiary of continued flight capital from China and increasingly Europe, in light of the turmoil surrounding the Brexit and the perception of the U.S. being late in the cycle,” the company said in a report. A rendering of U-One by Mission Group Homes near the UBC campus in Kelowna, B.C. For many years, a condo site in downtown Kelowna, B.C., had sat unfinished – an eyesore and reminder of the 2008 recession and collapse of a formerly booming market. The developer fell into receivership and halted construction on the luxury project. In 2012, Chinese developer Jingon, based in Richmond, bought the property for $3.8-million and announced plans to build a tower called Grace. 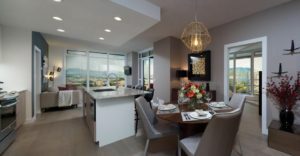 Plans changed again when Jingon partnered with Chilliwack-based Kerkhoff Construction to build 1151 Sunset Drive, a 124-luxury tower of one-, two- and three-bedroom condos and townhouses at ground level. They’ve just opened the presentation centre – a sign of the times for Canada’s fastest-growing metropolitan area. 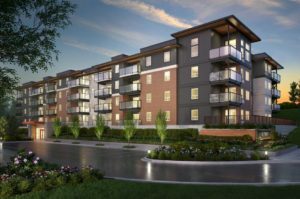 There’s been a major turnaround in Kelowna, which is currently booming from increased housing sales owing to residents from the Lower Mainland relocating there, as well as students attending the postsecondary schools there and deciding to stay. After years of on-again, off-again progress, the development at 1151 Sunset Drive, Kelowna is finally on the market. Exterior rendering. 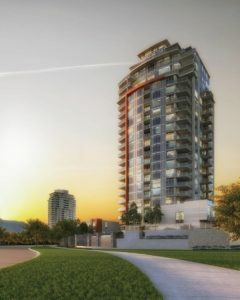 Communities such as Kelowna are reaping the rewards of Vancouver’s affordability crisis and transforming as a result. Over all, Metro Vancouver housing sales were down 26 per cent compared with August, 2015, according to just-released Real Estate Board of Greater Vancouver data. Meanwhile, desirable regions such as Kelowna are experiencing unprecedented growth. As of July, there had been a 51-per-cent increase in sales volume year-to-date over the previous year-to-date in Central Okanagan. Prices for houses have gone up by about $100,000 this year over last, there have been more multifamily dwelling starts than ever before and jobs are on the rise. “There has been an air of optimism in this city that hasn’t been felt in a long time – maybe if ever,” Kelowna Mayor Colin Basran says. At 38 years old, Mr. Basran, born and raised in Kelowna, represents the younger cohort. He says it’s not just the spillover from Vancouver that’s creating their boom, but efforts to build Kelowna’s tech and animation industry, as well as the growth of Okanagan College and UBC Okanagan. It’s too early to say if the growth is connected to the introduction of the 15-per-cent home-buyer’s tax on non-Canadian citizens and non-permanent residents living in the Lower Mainland. The province is set to release its next batch of foreign buying data in mid-September. Those numbers will be of particular interest because they could indicate the immediate effect of the new tax in Vancouver and the 21 communities where it applies. Instead, foreign buyers might be drawn to the Kelowna region because of the schools. The number of international students at UBC Okanagan (UBCO) grew from 12.8 per cent of the student population last year to a projected 14.1 per cent this year. Sixty per cent of all graduates stay in the area, according to UBCO’s data. Part of that is because of the foreign students that end up settling. Kelowna realtor Tony Zhao, who is from China, attended UBCO 11 years ago, when he was 18, and settled in Kelowna with his wife. He says about half his clientele are international buyers looking to invest or purchase houses and condos for their children attending school there. He networks directly with people in China looking to buy. Mr. Zhao believes the 15-per-cent tax in the Lower Mainland could create more demand for Kelowna, where it doesn’t apply, but he says it would be small. Most people are adopting a wait-and-see approach, he says. Kelowna has its own appeal for foreign buyers and it’s got nothing to do with the tax. The Kelowna market is a hot investment partly because of the low vacancy rate, too, which makes renting easy, he says. He estimates that more than half his clients want to make Kelowna their home. The others are investors. Okanagan Mainline Real Estate Board president Anthony Bastiaanssen says the number of buyers from the Lower Mainland has doubled, going from 10 per cent to about 20 per cent in the past year. It has coincided with a drop of about the same number of Albertan buyers. “We have the best market we’ve ever had,” Mr. Bastiaanssen says. “Last month, the average single family house price was over $600,000, which is an all-time record for the Central Okanagan. So, we are at peak levels of activity and average pricing. Communities such as Kelowna are reaping the rewards of Vancouver’s affordability crisis and transforming as a result. Luxury sales have also gone up in the past year, he says. An entry-level price for a waterfront property is around $1.5-million, which would be 20 minutes away, in Peachland. 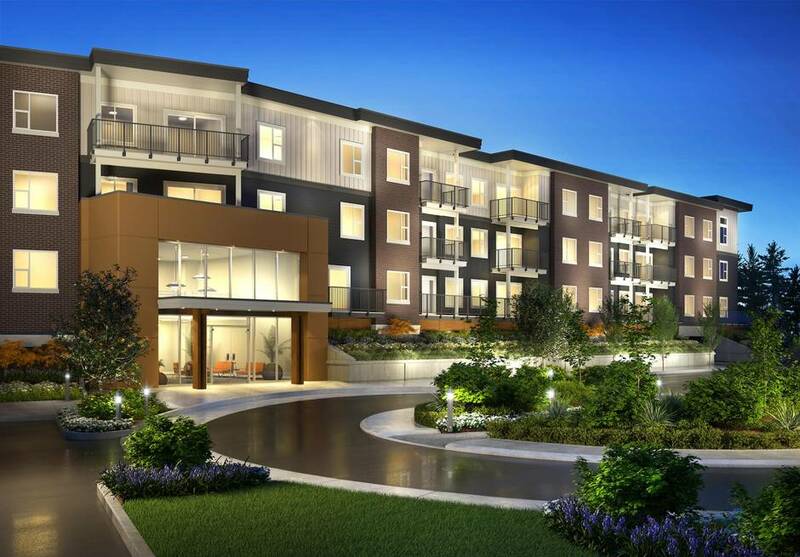 The Mission Group is Kelowna’s biggest developer of multiunit dwellings, averaging about 200 to 300 units a year. President Randy Shier says the market started recovering from the recession around 2014. But this cycle is different. The wealth moving into the market is bigger and the 20-to-34 age group is also driving the mid-market growth. Workers have made the shift from the old traditional mill-type jobs to occupations in which people can work at home, such as tech or consultancy jobs. The city is also a commercial hub for much of the province, offering jobs for engineers and lawyers. Mr. Shier has tapped into the student market by providing housing with a series of condo buildings adjacent to UBCO, called U-One, U-Two and U-Three. By the time they are built out in August, 2018, his projects will house more than 1,600 students. His latest U-Three project is getting more investors, parents of international students who want to invest in their child’s accommodation. His downtown condo project Central Green is also drawing young buyers, with prices between mid-$200,000 and mid-$400,000. One-bedrooms are about 550 square feet. The boomtown effect isn’t all positive, however. It’s meant low-income residents are getting squeezed. With the market up, homeowners are cashing out and selling off their rental properties. A rendering of a unit at 1151 Sunset Drive. Royal LePage managing broker Francis Braam has been selling in the area since 1988 and says this is by far the busiest cycle yet. And if the boom is happening in a tiny community, such as Sechelt on the Sunshine Coast, the effect can be overwhelming, particularly for local workers. Rentals there are evaporating as people sell off their rental homes for big prices. Sechelt deputy mayor Alice Lutes has lived in the community most of her life. “It’s worrisome,” she says. “Right now for low-income earners looking for a place to rent, they are getting pushed out. A lot of them are squeezing in with family members, hoping it will be temporary. And I don’t know if that’s true at this point.